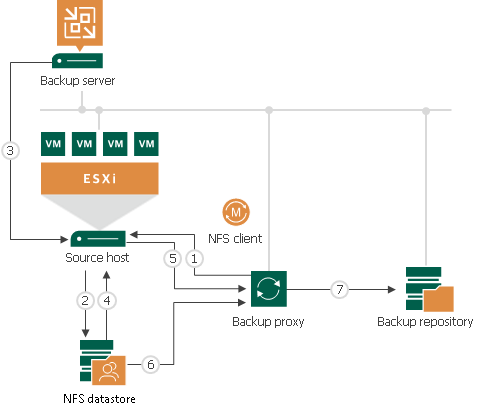 The backup proxy sends a request to the ESX(i) host to locate a VM on the NFS datastore. The ESX(i) host locates the VM. Veeam Backup & Replication triggers VMware vSphere to create a VM snapshot. The ESX(i) host retrieves metadata about the layout of VM disks on the storage (physical addresses of data blocks). The ESX(i) host sends metadata to the backup proxy. The backup proxy uses metadata to copy VM data blocks directly from the NFS datastore over LAN. The backup proxy processes copied data blocks and sends them to the target over LAN.